•	In August, Donna creates a master list of 25–35 restaurants based upon her dining experiences throughout the year. •	A dining group—made up of approximately 12 diners who represent a cross section of food knowledge and dining experience—is organized, and a dining schedule created. 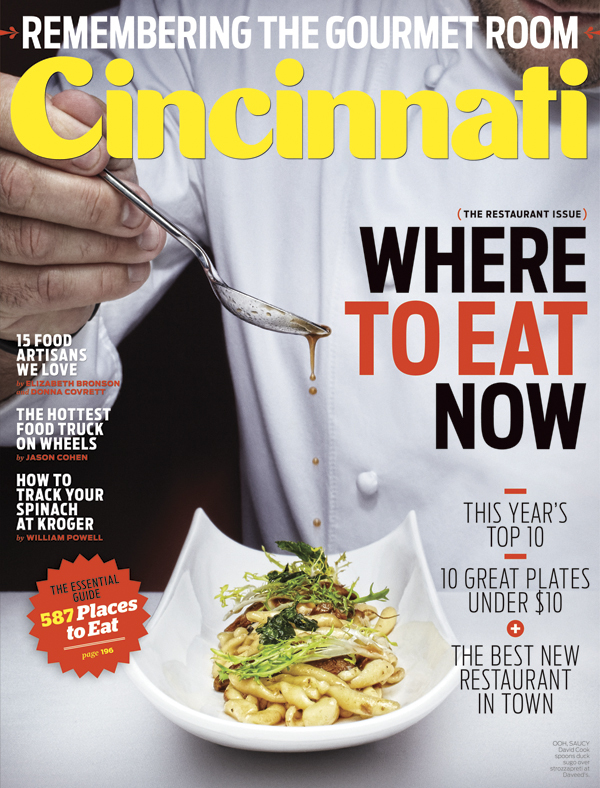 Other than Donna, none of the other diners are employees of or affiliated with Cincinnati Magazine. •	Over a six to eight week period, Donna dines at every restaurant on the master list with two or three companions from the dining group. If reservations are necessary, they are always made under an assumed name, and by someone other than Donna. •	If it is a restaurant where she can be identified by staff (usually about 25 percent of the master list), the other diners are sent in 15 to 20 minutes ahead to determine if there is any discernable difference in food or service after Donna arrives. If there is, it is reflected in the final tally as a subtracted point (more on that below). •	The group orders as much food from the menu as possible without duplicating any dishes (generally three or four courses per person). If wine service or specialty cocktails are part of the restaurant’s profile, those are ordered as well. Unless there are dietary requirements, everyone at the table is required to taste every dish and beverage. •	No free food is knowingly accepted. If a chef sends out a dish that wasn’t ordered, the server is asked to add it to the bill. •	After dinner, the group retires to another site to discuss and give their experience a rating. •	Created with the help of a statistician and a psychologist (two data gathering professions), the rating system consists of four categories (food, service, atmosphere, and miscellaneous) with five criteria in each category. Each individual criteria is assigned a scale of points, and the points for both category and criteria are weighted. The more important the criteria or category, the higher its point value. •	Each criteria is discussed in detail and points determined. •	After the entire master list has been visited and rated, the group meets as a whole to look at the top vote getters, revisit and discuss the experiences, and break apart ties (which often requires an additional visit to the restaurant). It’s impossible to be 100 percent objective when you’re dealing with such subjective criteria, but by creating this system, Donna comes as close as she can. If it were up to you, how would you come up with the Top 10? Go to Donna’s dining blog and tell us.